Our Green Apple & Ginger Chutney is made using traditional recipes using the finest crunchy heritage green apples. 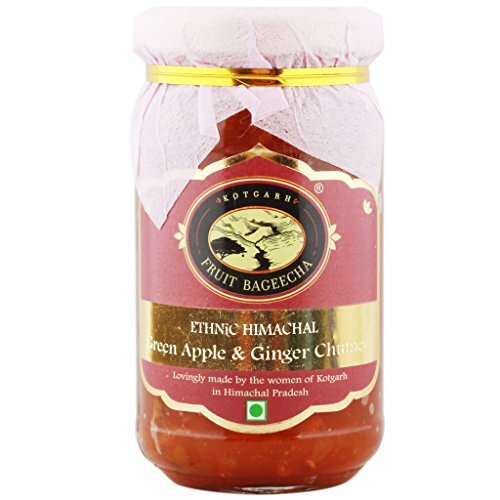 Our chutneys are bottled at source in India's finest apple orchards in the middle Himalayas. This unique product is for the discerning consumers who appreciate a little sweet and spice addition to their meals. Our Green Apple & Ginger Chutney is made using traditional recipes using the finest crunchy heritage green apples. Our chutneys are bottled at source in India's finest apple orchards in the middle Himalayas. This unique product is for the discerning consumers who appreciate a little sweet and spice addition to their meals. Contains 55% fruit content. No colour or flavour is added to this product. Our products are passionately made by hand by the local self-help groups of village Pamlai, in Himachal Pradesh. Snow or shine doesn?t deter their passion! Enjoyed locally, our aim is to make these delicious ethnic recipes available to our consumers everywhere. If you have any questions about this product by Kotgarh Fruit Bageecha, contact us by completing and submitting the form below. If you are looking for a specif part number, please include it with your message.